3 Trees Holiday stationery paper is the perfect background for your holiday messages, flyers, or invitations this season! 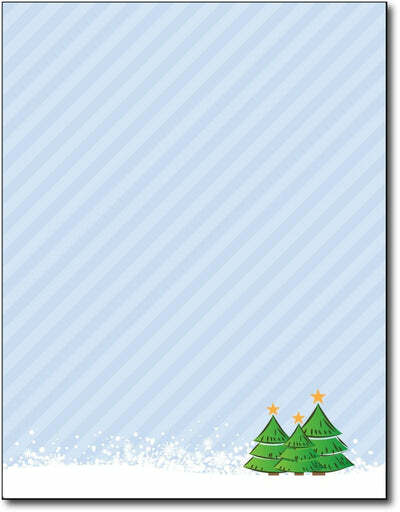 This simple holiday design features 3 Christmas trees with stars on top sitting on snow covered ground with a blue striped background for your message. This stock used for this Christmas tree stationery design is a premium quality 28lb Bond / 70lb Text paper, and measures 8 1/2" X 11". This Christmas letter writing paper works perfect in laser and inkjet printers, as well as copiers of all kinds.